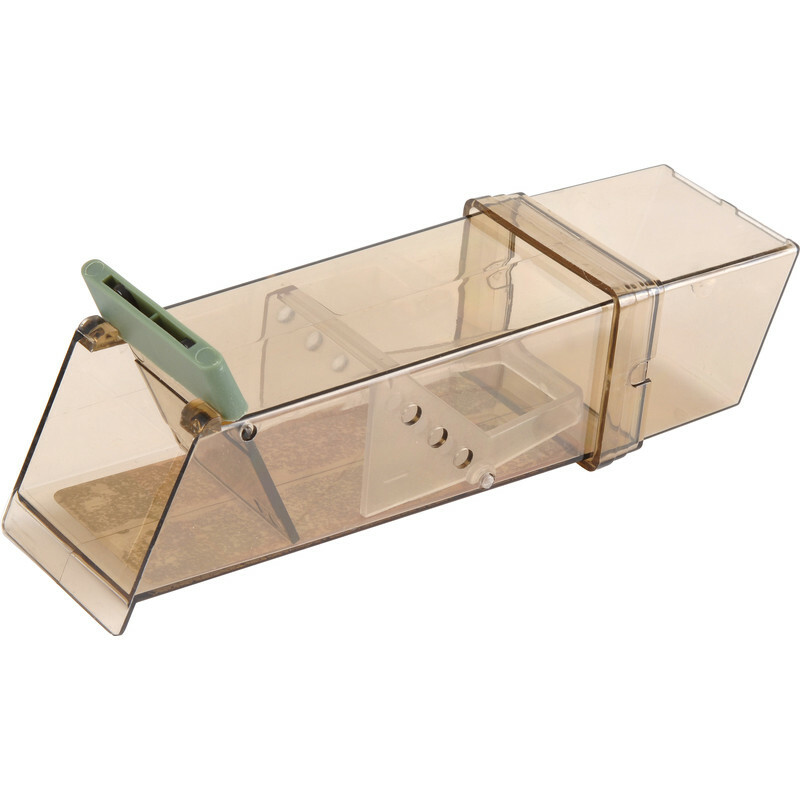 British-designed trap, developed to minimise stress and avoid harm to captured mice. Pest-Stop Trip-Trap Mouse Trap is rated 4.2 out of 5 by 130. Rated 5 out of 5 by Jennifer from Worked first time! Put a bit of bird seed in chamber before going to bed, checked at 2am and one little mouse alive and well, then released back into garden (had been brought in by cat). Very happy all round! Rated 5 out of 5 by Pange from One mouse down, several to go... I bought this a week ago and on the same day caught one rascally creature. I wait to see if it works for the others which I suspect are somewhere under the floorboards. . . Rated 1 out of 5 by zyxwv from Bait gone but no mouse The trap door mechanism is clearly not reliable/effective since the bait disappeared without leaving a mouse behind. Rated 3 out of 5 by Dangermouse9000 from Needs air holes! Potentially effective and humane trap but has a serious problem - no air holes! If you buy one please drill a few holes to prevent suffocation. Rated 5 out of 5 by MartB from Excellent, but comes with a flaw probably. There is no doubt this contraption is tremendous at catching mice. It's caught a mouse every night since I bought it. The flaw I suppose is, I don't know if I've caught six mice, (and counting) or one mouse six times. (If it is one mouse it must be really thick.) Whatever, it's better than another brand of similar trap that has yet to break it's duck. Rated 5 out of 5 by wormhole from Perfect!! This mouse trap was perfect, Put a bit of peanut butter in the trap, within 2 days we had caught the mouse, And being made of clear plastic we could check it regularly without disturbing it,once i caught the mouse it was easy to release him back into the wild.. Rated 1 out of 5 by JA123456 from Didn’t work Trap length too short, which allows the mouse to beat the door. Door was activated most nights with no mouse inside. Sometimes they even got the bait. In the end it just chewed through the plastic from outside to get the bait. Got a much larger and longer trap elsewhere which worked first time.